THIS SOFTWARE END-USER LICENSE AGREEMENT (“Agreement”) CONTAINS THE LICENSE TERMS AND CONDITIONS FOR THE XEROX SOFTWARE (“Software”). PLEASE READ CAREFULLY BEFORE DOWNLOADING, INSTALLING OR USING THIS SOFTWARE PRODUCT. BY DOWNLOADING, INSTALLING OR USING THE SOFTWARE, YOU AGREE TO BE LEGALLY BOUND BY THE TERMS AND CONDITIONS OF THIS AGREEMENT. IF YOU DO NOT ACCEPT THESE TERMS AND CONDITIONS YOU MAY NOT DOWNLOAD, INSTALL OR USE THE SOFTWARE AND YOU MUST DELETE ANY SOFTWARE FILES ACCESSED BY YOU OR A THIRD PARTY ON YOUR BEHALF FROM ANY AND ALL COMPUTER MEMORY INTO WHICH SUCH SOFTWARE HAS BEEN LOADED OR STORED. When used in this Agreement the term "Xerox" means Xerox Corporation, its operating companies, subsidiaries and affiliates, and “You” means the individual or legal entity acquiring the software. If you are installing the Software on behalf of the end user you agree that you are acting as an agent of the end user customer before proceeding and that you have either; 1) read and agree to the terms of this Agreement as authorized by the end user, or 2) you have made the end user aware of the license terms and the end user has explicitly accepted them. 1. LICENSE GRANT. For as long as you comply with the terms of this Agreement Xerox grants to you a non-exclusive, non-transferable license to install and use the Software on single item of Xerox-brand equipment which you own or control as specified in the documentation provided with the Software or available via download (“Documentation”). You may move the Software from device to a second device; provided that you completely uninstall the Software from the first device as specified in the Documentation. You may not use the Software on multiple items of equipment at one time without first obtaining a separate license for each item of equipment and paying any applicable license fees. You have no other rights to the Software and may not: (i) distribute, copy, modify, create derivatives of, decompile, or reverse engineer Software; (ii) activate Software delivered in an inactivated state; or (iii) allow others to engage in same. You may make one (1) archival or back-up copies of the Software, provided such copy contains all of the copyright and other proprietary notices contained on the original Software and is used only for back-up purposes. Title to, and all intellectual property rights in, Software will reside solely with Xerox and/or its licensors who will be considered third-party beneficiaries of this Agreement. 2. THIRD PARTY SOFTWARE. The Software may include code developed by one or more third parties. Some third party materials included in Software may be subject to other terms and conditions found in a “ReadMe” file accessible with the Software as a download, on media on which the Software may be delivered, or in equipment documentation. If the third party terms and conditions include licenses that provide for the availability of source code (such as the GNU General Public License), the “ReadMe” file, the media on which the Software may be delivered, or the equipment documentation contain the source code or provides instructions where a copy of such source code can be obtained. 3. DISCLAIMER OF WARRANTY. YOU ACKNOWLEDGE AND AGREE THAT THE SOFTWARE IS PROVIDED “AS IS”, WITHOUT WARRANTY OF ANY KIND BY XEROX OR ITS LICENSORS. XEROX AND ITS LICENSORS EXPRESSLY DISCLAIM ALL WARRANTIES, EXPRESS OR IMPLIED, WHETHER CREATED BY STATUTE OR OTHERWISE, INCLUDING, BUT NOT LIMITED TO, ANY WARRANTIES OF FITNESS FOR A PARTICULAR PURPOSE, MERCHANTABILITY OR NON-INFRINGEMENT OF THIRD-PARTY RIGHTS. XEROX AND ITS LICENSORS DO NOT WARRANT THAT THE SOFTWARE WILL MEET YOUR PARTICULAR REQUIREMENTS, THAT IT WILL OPERATE UNINTERRUPTED OR ERROR FREE, OR THAT DEFECTS IN THE SOFTWARE CAN OR WILL BE CORRECTED. ALL WARRANTIES AND REPRESENTATIONS MADE BY PERSONS OTHER THAN XEROX, INCLUDING, BUT NOT LIMITED TO, YOUR AUTHORIZED SERVICE PROVIDER, DISTRIBUTORS, DEALERS, CONCESSIONAIRES AND OTHER RESELLERS OF XEROX, ARE ALSO DISCLAIMED. THE WARRANTY DISCLAIMERS SET FORTH HEREIN MAY NOT APPLY IN CERTAIN JURISDICTIONS, IN WHICH CASE THE WARRANTEES HEREUNDER SHALL BE THE MINIMUM REQUIRED BY APPLICABLE LAW. 4. INDEMNIFICATION. Xerox will pay any settlement agreed to by Xerox or any final judgment for, any claim that Software infringes a third party’s valid United States patent or copyright, provided that you promptly notify Xerox in writing of any alleged infringement, allow Xerox to direct the defense, and fully cooperate with Xerox. Xerox is not responsible for any non-Xerox litigation expenses or settlements unless Xerox agrees to them in writing. To avoid infringement, even if not alleged, Xerox may, at its option, and at no charge to you, either obtain a license, provide a replacement for the Software or remove or request that you remove the Software. Xerox’s obligations under this section are further conditioned on you immediately removing and ceasing use of the Software in the event that Xerox requests that you remove the Software and/or provides a replacement. Xerox will not be liable for any infringement-related liability outside the scope of this section, including, without limitation, infringement based upon the Software being modified to your specifications or due to the Software being used in combination with equipment, software or supplies not provided by Xerox. 5. LIMITATION OF LIABILITY. Notwithstanding any damages that you might incur, the entire liability of Xerox and its licensors under this Agreement and your exclusive remedy will be limited to the greater of the amount actually paid by you for the Software or U.S. $10.00. IN NO EVENT WILL XEROX OR ITS LICENSORS BE LIABLE TO YOU FOR ANY SPECIAL, INDIRECT, INCIDENTAL OR CONSEQUENTIAL DAMAGES (INCUDING BUT NOT LIMITED TO DAMAGES RELATED TO DATA LOSS, LOST PROFITS OR BUSINESS INTERRUPTION) IN ANY WAY ARISING OUT OF OR RELATING TO THE SUBJECT MATTER OF THIS AGREEMENT, EVEN IF XEROX OR ITS LICENSORS HAS BEEN ADVISED OF THE POSSIBILITY OF SUCH DAMAGES AND EVEN IF THE ABOVE REMEDY FAILS OF ITS ESSENTIAL PURPOSE. THE LIMITATIONS OF LIABILITY SET FORTH HEREIN MAY NOT APPLY IN CERTAIN JURISDICTIONS AND THUS MAY NOT APPLY TO YOU; IN SUCH CASES, XEROX&apos;S AND ITS LICENSORS&apos; LIABILITY HEREUNDER SHALL BE THE MINIMUM REQUIRED BY LAW. 6. TERM AND TERMINATION. The term of the license granted in this Agreement will commence on the earlier of date on which you download, install, enable or otherwise take delivery of the Software and will continue for as long as you comply with the terms of this Agreement. The license granted in this Agreement will terminate: (i) immediately if you no longer use or possess the equipment with which the Software was provided or are a lessor of the equipment with which the Software was provided and your first lessee no longer uses or possesses it, (ii) upon the termination of any agreement under which you have rented or leased the equipment with which the Software was provided, or (iii) immediately in the event of a breach by you.. Upon termination for whatever reason, you shall de-install the Software and return or destroy, at Xerox&apos; option and direction, the Software, your back up copy and all materials provided or made accessible by Xerox under this Agreement. 7. US GOVERNMENT RESTRICTED RIGHTS. The Software is provided with Restricted Rights. You agree to meet all requirements necessary to ensure that the Federal Government will honor such rights. Disclosure, use or reproduction of the Software and accompanying documentation are subject to restrictions set forth in the Commercial Computer-Restricted Rights clause at Federal Acquisition Regulation 52.227-19, when applicable, or in the Department of Defense Federal Acquisition Regulations Supplement 252.227-7013. The Software was developed entirely at private expense and is commercial computer software. Use of the Software by the Government is further restricted in accordance with the terms and conditions of this Agreement. 8. SEVERABILITY. If any provision of this Agreement is held invalid by any law, rule, order or regulation of any government, or by the final determination of any state or federal court, such invalidity will not affect the enforceability of any other provisions not held to be invalid. In the event any provision hereof is declared by competent authority to be invalid, illegal or unenforceable under any applicable law, to the extent permissible under applicable law, any such invalid, illegal or unenforceable provision shall be deemed amended lawfully to conform to the intent of the Parties. 9. NO WAIVER. Any delay or omission by either party to exercise any right or remedy under this Agreement will not be construed to be a waiver of any such right or remedy or any other right or remedy. All of the rights of either party under this Agreement will be cumulative and may be exercised separately or concurrently. 10. GOVERNING LAW. This Agreement shall be construed in accordance with the laws of the State of New York, without regard to its choice of laws provisions, and disputes shall be adjudicated or otherwise decided in the forums therefor located in the State of New York. The United Nation Convention on Contracts for International Sales of Goods shall not apply to this Agreement. Local law may require that certain laws of your country of residence apply to some sections of this Agreement, including but not limited to, requiring this Agreement to be governed by the laws of your country of residence. 11. EXPORT. You will not export or re-export the Software without appropriate United States or foreign government licenses or for any purpose prohibited by any applicable export control laws. 12. DATA COLLECTION. “Data” shall mean information which may be stored by you or Xerox in the memory of the equipment on which the Software is installed which is related to the provision of service or support for the equipment or to your use of the equipment and/or Software, including, without limitation, machine configuration data and settings, product registration, meter read, supply level, software versions, problem/fault code data, and printing job characteristics. All such data shall be transmitted in a secure manner specified by Xerox. 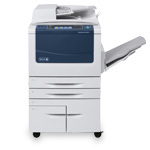 The automatic data transmission capability will not allow Xerox to read, view or download the content of any of your documents residing on or passing through the Equipment or your information management systems. Your information may be transmitted, stored and processed in the United States or any other country in which Xerox or its designated servicers or subcontractors maintain facilities. 13. ENTIRE AGREEMENT. This Agreement constitutes the entire agreement between the parties in connection with the subject matter hereof, and supersedes all prior agreements, understandings, negotiations and discussions, whether oral or written, between the parties. No amendment to or modification of this Agreement will be binding unless it is in writing and signed by a duly authorized representative of each of the parties.